October 5th, 2017 by alisonpepler. Posted under News, Race Reports with 0 responses . October 4th, 2017 by alisonpepler. October 3rd, 2017 by alisonpepler. Here we go again, this year (2017) we are racing with the Classic Touring Car Race Club under BARC, throughout the year we will be racing alongside various championships, still under our name the 4two cup. January 21st, 2017 by alisonpepler. 2016 saw the 4two cup enter into its 6th year of racing again running under the administration of the BRSCC and racing alongside the Honda Vtec Challenge. 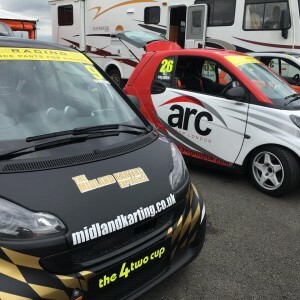 A late start to the season with the first race not being until the 8th May gave us plenty of time to carry out the new modifications to the suspension to lower the cars and rewrap some of the cars with new sponsor logo’s, Arc building group, Midland Karting and Roydon packaging. 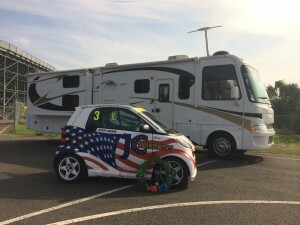 Alistair Woodhead who was in the no.2 Smarts4youRacing 451 car (class 1) had decided to purchase his own car this year a Smart 450 (class 2) no.8 and was all set for the season ahead. Last years series winner Martyn Clatworthy took the 1st win with Alan Palmer taking the 2nd race win. A huge effort by novice Simon Coverdale saw him take his first podium position of 3rd in race 2. Both fastest laps were set by Martyn. 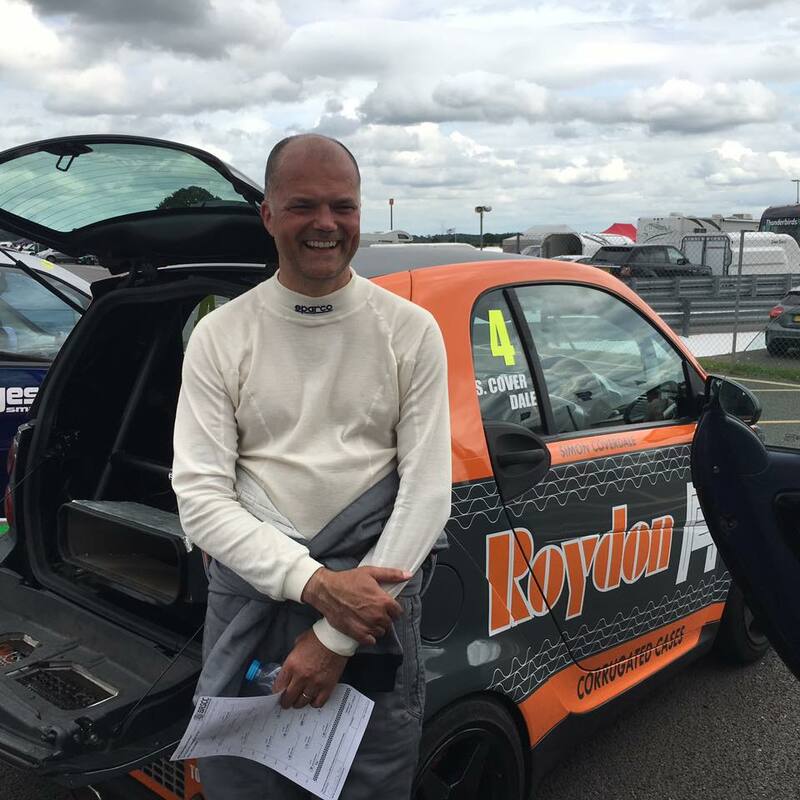 Onto Rockingham in Northamptonshire for rounds 3 & 4 where Greg Owens had a fantastic weekend taking pole position in qualifying, 2nd in race 1 and 3rd in race 2. Alistair Woodhead took pole position in his new class 2 car ahead of Mark Bloomfield a.k.a. Fudge, however he didn’t manage a victory this weekend with Fudge taking both wins. Martyn took the 1st win but had to retire in the 2nd race due to a puncture which allowed Alan to take his 2nd win of the season. Fastest laps were set by Martyn and Alan. Rounds 5 & 6 saw the 4two cup head to Snetterton, a new circuit for some of the drivers as this wasn’t on last years calendar but a favourite of series owner James Palmer who almost had a full house of pole position, both wins but only 1 fastest lap as Martyn managed to take it on race 1. Ian Weir a.k.a. Sparky qualified ahead of Alistair and went on to take both wins in class 2. With temperatures soaring to 25 degrees, it was tough for the drivers who I’m sure were relieved to get back to the paddock for a well deserved cold drink. So the grand finale… Donington Park. The weather wasn’t being kind with qualifying in the pouring rain, Alan took pole position followed by Simon and Nash. The rain stopped in time for race 1 but the track was still wet which caused havoc for many of the drivers. 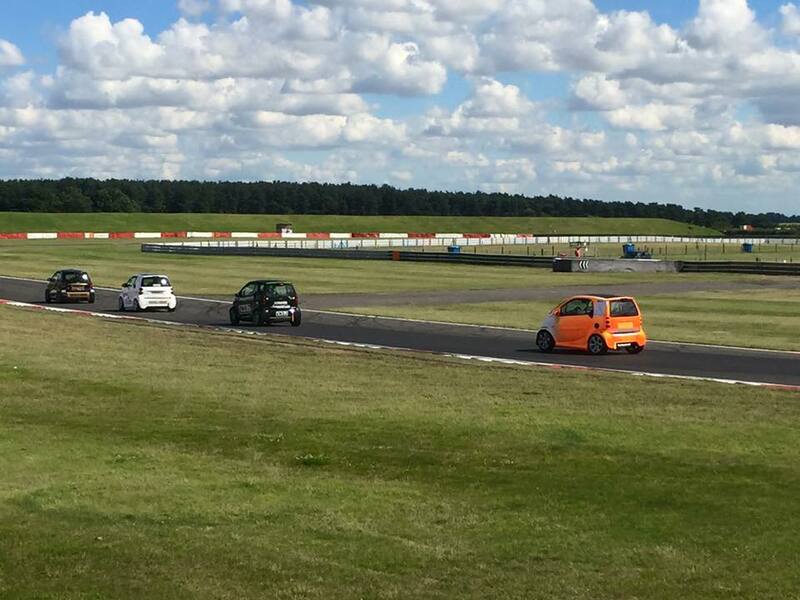 Alan got away at the start whilst separate spins for the 3 cars behind gave him a big advantage allowing him to take the win 20 seconds ahead of 2nd place James. With pole, a win and fastest lap, Alan only needed to finish at least 3rd or ahead of James in race 2 to secure the series title which he did by going on to take his 2nd win of the day in dry sunny conditions with James just behind him in second. Nash took two 3rd place podiums this weekend to secure him 3rd place in the series and Alistair Woodhead was the only 450 out and therefore took 2 trophies home this weekend making him series winner of class 2. With a glorious sunrise over the garages, the day looked to be getting off to the perfect start, however heavy rain began to fall soon after sunrise, soaking the track. Being the first cars on track, there was no way to gauge what grip was available (if any) or where it was located. Conditions remained terrible as the cars were called to the assembly area, to wait for their allocated time slot. With rivers of water washing across the track, cars were spinning everywhere but they all managed to finish and get back to the paddock safely. With race time upon us, drivers suited up and headed to the assembly area. Whilst the rain had now stopped and the wind was helping to dry the track, there was still no dry line and spray was clearly visible from the cars still out on track. With the usual remnants of Caterham’s cleared away from the previous race, the cars were released to head out onto the green flag lap. Once all cars had completed the opening lap, all cars took up their grid slot in preparation for the race ahead. Alan Palmer got away cleanly in pole position while separate spins for all 3 cars behind gave Alan a big advantage and so he went on to take the 1st win of the day with James in 2nd still battling it out for the series and Nash in 3rd. Unfortunately a problem with the number 9 car of Greg Owens meant he didn’t manage to finish his race. With only 5 Smartie points in it for the series win going into the last race of the day was very exciting for both the Palmers, Nash looked set to take an overall comfortable 3rd going into this last race and Greg and Simon were still on for battling into 4th. In dry sunny conditions for this 2nd race, James went all out to get in front which he managed to do going into the 1st corner, Nash was pressuring Alan hard and managed to squeeze through demoting Alan to 3rd but a spin for Nash in the Roberts Chicane handed 2nd place back to Alan. James continued to build his lead and was set to take the race win but a spin causing him to lose his back end at the old hairpin let Alan through to take the lead. Despite James closing up the gap between himself and Alan to within a second, he wasn’t quite close enough to challenge and Alan once again took the checkered flag and the overall honours. Simon held on for 4th position with Greg in 5th. Alistair Woodhead had a great race and although was the only 450 in class 2, he thoroughly enjoyed himself. Thanks to everyone for coming along and supporting us all throughout the season, drivers and family, thanks to all our sponsors including JCMotorhomes, 1st Containers, pure d-zign, ARC building group, Midland Karting and Roydon Packaging. Thanks also to all you guys who help in the set up and the dismantle of the awning, your help is massively appreciated, looking forward to next season already as there are big plans for ECU mods over the winter which will see an improved performance for the pocket rockets next season. See you all next year if not before. After our last trip to Anglesey in Wales, it was time to head North this time to Croft in Yorkshire. 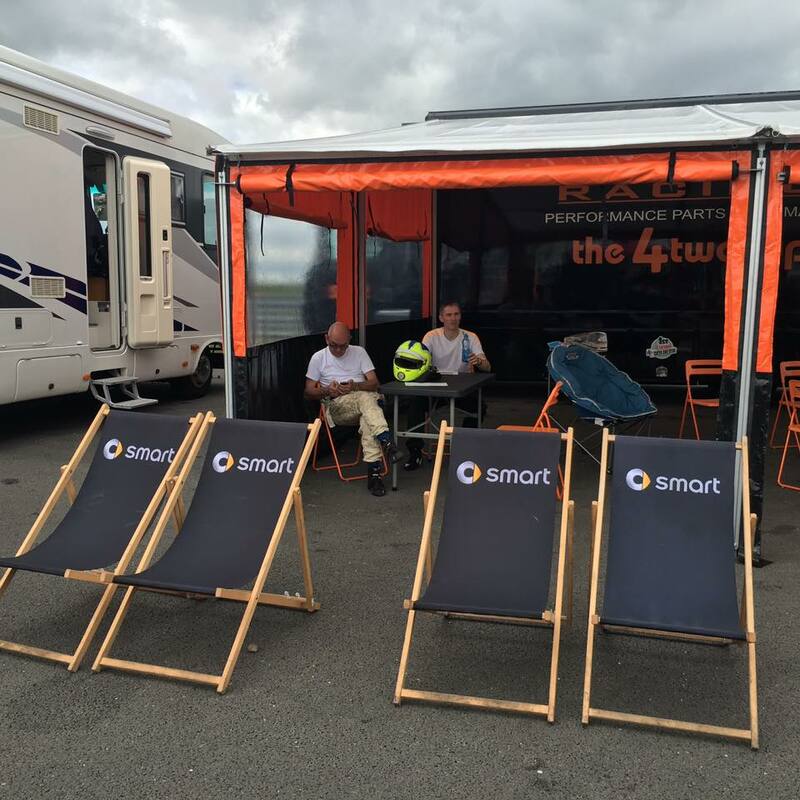 This weekends racing unfortunately clashed with Goodwood Revival where a few of our drivers had tickets and therefore couldn’t be with us and whilst the majority of the UK was subjected to torrential rain, Croft was blessed with glorious sunshine. A different layout this weekend with qualifying being the last track action of the day on Saturday and both races on the Sunday. With Alan Palmer being only 1 smartie point ahead in the series title, the weekend was set to be an exciting one. Nash took the lead and held onto it to qualify in pole position with James and Alan battling it out for second, Alan managed to hold James off and went on to take 2nd position, Last years series winner Martyn Clatworthy seemed to have a problem as he qualified just over 5 seconds slower than the others. Another fun night with all the drivers, family and friends enjoying a BBQ and a few drinks together, celebrating Martyn and Helens anniversary and an unusually late start at Croft due to local noise restrictions meant track action didn’t get underway until midday. With race time approaching, drivers were suited up and headed to the assembly area, once released, they made their way around the track to take up their grid slots.With the marshals cleared from the grid, all focus was on the lights with drivers looking to make a great start. Nash took the lead closely followed by Alan who then lost out to James who squeezed up the inside of him on the run down to the first corner, both Palmers challenged Nash into the sunny complex but Alan locked up under braking and lost some ground, Alan chased hard despite a worsening vibration under braking to fight back onto the tail of James. Unfortunately as suspected after qualifying Martyn had a problem and was forced to retire after lap 3. Alan managed to get past James and set about chasing Nash but unfortunately his race ended prematurely when he realised the reason for the vibration was a puncture, Nash held onto his lead and went onto win the race. A few hours of hanging around until race 2 gave James a chance to see if Martyns car could be sorted but unfortunately it couldn’t so it was time for poor Martyn to hang up his boots for the weekend (and for the season as he can’t be with us at the next race) and relax with a beer. 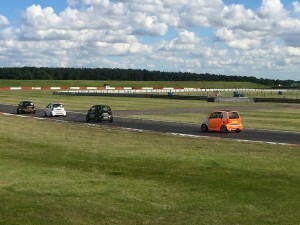 James took the lead with Nash on his tail chasing, James went a little too deep into Sunny on lap 3 allowing Nash and Alan to pass but James managed to get back past Alan who missed a gear exiting the final hairpin. All 3 drivers battled hard for the rest of the race and it was almost neck and neck going into the final stages. With 3 laps to go Alan got a great run out of the chicane to pass James on the straight down to Tower bend and on the last lap unfortunately for Nash, his exit out of the chicane was compromised by a lapping Honda ( who we share the grid with) allowing Alan to get alongside him on the straight and pass him around the outside of tower bend to steal the lead and take the checkered flag. Huge thanks as always to all our sponsors including JCMotorhomes, 1st Containers, pure d-zign, ARC building group, Midland Karting and Roydon Packaging. August 15th, 2016 by alisonpepler. After a short break from the last race at Snetterton we were off racing again, this time to Anglesey, unfortunately none of the 450’s could make this weekend nor last years series winner Martyn Clatworthy who was jetting off on holiday, however the 5 drivers that could make it, having never been at this circuit before, were all really looking forward to it. After a 300 mile drive, we arrived tired on the Thursday evening, dropped off the vehicles at the circuit and went in search of our B & B.
Friday was a test day which all drivers except Alan Palmer took part in, there was also a 20 minute test session on Saturday morning which all the drivers entered. The weekends racing was to be on the coastal circuit, a last minute change from the originally advertised International circuit unfortunately due to a lack of marshalls. Lots of bends and gradients on this circuit was sure to make for an interesting weekends racing, it was a beautiful view for the spectators on the hill with the sea in the background and almost all the track visible, they did however have to suffer the burning rubber smell with cars locking up their brakes on the corkscrew but it was worth it. All drivers had a qood qualifying session finishing within 0.5 seconds of each other, Simon Coverdale went off coming out of turn 1 but managed to get it back well. James jumped ahead of David off the start, with the rest following closely behind. Alan overtook David just before rocket and also got past James going into rocket bend albeit somewhat precariously sending James into the grass. Greg was now up into 2nd and trying eagerly to catch up with Alan which he did but after a couple of laps, Owens collided with Alan after the banking causing himself to have a spin and James to swerve to avoid him, this allowed Simon Coverdale to get up into 3rd, Greg nicked it back off Simon but Greg was forced to resign from a black and orange flag due to his wing hanging off and getting worse after his bump with Alan. David had unfortunately span at Peel on lap 2 losing his position and again just after at turn 1 rejoining a fair distance back from the others. 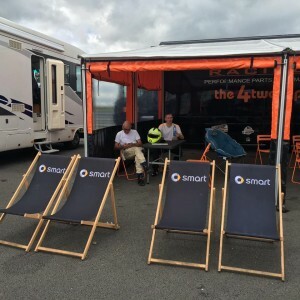 Another great fun weekend and all the drivers agreed that although it was a very long way to get there, they would definitely do Anglesey again as they thoroughly enjoyed it. Looking forward to the next race at Croft on the 10th and 11th of September, unfortunately we will have a small grid again as some of the drivers are heading of to the Goodwood revival but we will still have fun. August 11th, 2016 by alisonpepler. A slightly different set up this weekend in that all the drivers had a 30 minute test session on the Saturday Morning and both races were to be 20 minutes instead of the usual 15. An early start with sign on and scrutineering from 7.30am, testing kicked off at 9am with the Smarts, Honda’s and TVR’s, all went well for the smarts, Simon Coverdale had a slight problem on the last lap but was as easy as changing a crank shaft sensor and they were all ready and eager for qualifying to start. James Palmer held onto his lead at the start with Simon Coverdale closely behind who got a great start shooting from 6th up into 2nd. With longer lap times than usual, it made for an exciting close race. Alan Palmer managed to get past Simon and was chasing down James into bombhole where he managed to get past him and into the lead, James reeled him back again and got past him on the Bentley straight, not giving up, Alan fought back but unfortunately hit James on the rear causing him to lose a wing and slow him down. As with qualifying, positions chopped and changed every lap as there were a few impressive spins, meanwhile the 450’s had a great time with Alistair chasing down Ian (a.k.a sparky) but Ian held him off to take the win in Class 2. The weather didn’t seem to be cooling down making it really tough on the drivers but great for the spectators 🙂 James had a great race and secured his second win of the day, (a first for James) Again a couple of spins this afternoon due to the high temperatures, unfortunately Alistair Woodhead had to retire with a small problem but everyone else finished and were I’m sure relieved to get back to the paddock for a cold drink and cool down. See you all at the next race in Anglesey on the 6th/7th August, a long way for most of us but I am sure it will be worth it.